The benchmarking expert P3 has been testing the Dutch mobile networks since 2015, showing always excellent and continuously increasing network performance in the Netherlands. With significant changes in the market due to recent mergers, our fourth mobile network test once more promises an exciting race. How did the four independent candidates perform this time? The P3 connect Mobile Benchmark in the Netherlands has always shown very strong results. This year, the three strongest contenders have once again improved on their results, with only Tele2 falling a little behind last year’s score. P3‘s network benchmarks are widely accepted as the de-facto industry standard and for being highly objective. The carefully designed methodology of our 2018 benchmark in the Netherlands combines two cars conducting drivetests in 21 Dutch cities and on the connecting roads between them with walktests in seven larger cities and tests on Dutch railways. The areas in which we have tested account for more than 5.7 million people, or for about 34 per cent of the Dutch population. P3‘s measurement included the use of up-to-date LTE Cat 9 as well as VoLTE-capable smartphones for the tests. Also, we constantly readjust the thresholds of our evaluation with steps like these we take the latest technical developments of the mobile networks into account. The scope of our benchmark is to show how the mobile networks perform at the edge of what is technically feasible – and to what extent do customers benefit from these capabilities? In order to provide valid assessments, we have also used the most comprehensive mobile plans available from each operator. As in the two previous years, the overall winner is T-Mobile. This time, the winner even achieves an impressive 977 points – the highest score which has ever been achieved in a P3 connect Mobile Benchmark – and the grade „outstanding“. Vodafone follows closely behind achieving the same grade. KPN ranks third with the overall grade “very good”. 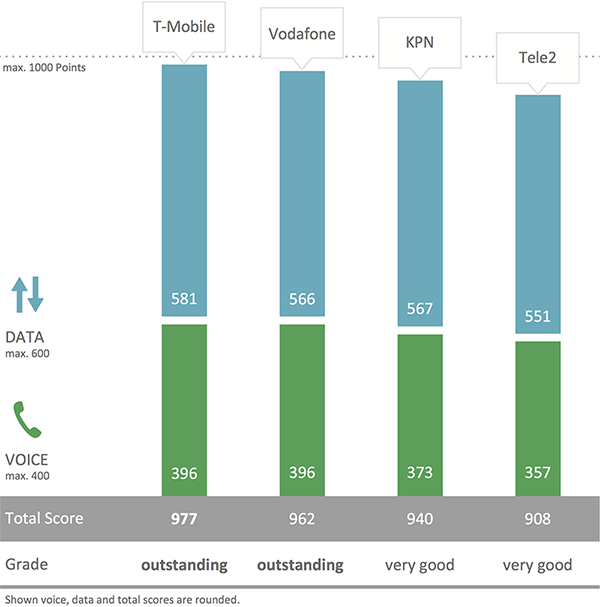 All three operators were able to improve clearly compared to their 2017 results, with Vodafone making the biggest leap (+31 points), followed by T-Mobile (+21 points) and KPN (+10 points). Only Tele2 has lost some ground (-11 points) compared to its 2017 score. T-Mobile maintains the lead in almost every service and category. However, all in all T-Mobile, Vodafone and KPN show excellent results. KPN has lost points because of slightly inferior speech quality and longer call setup times. All Dutch operators show a strong performance for all data services on connecting roads as well as in trains. The mobile networks in the Netherlands are famous for their high performance level. In recent years, the smaller Dutch operators conducted various mergers and acquisitions in order to attack the market leader KPN. The KoninklijkePTT Nederland N.V. emerged from the privatisation of the formerly state-owned PTT in 1998. With about 8 million mobile customers, KPN had a market share of about 44 per cent in the Netherlands at the end of 2017. With these numbers, the company is by far the largest Dutch mobile operator. For the fiscal year 2017, the company reported a total revenue of 6.5 billion Euros. The company focuses on marketing its KPN brand, however with Simyo, Telfort and Ortel it also has offerings in the “no-frills“ segment. KPN operates 2G/GSM at 900 and 1800 MHz, 3G/UMTS at 900 and 2100 MHz and 4G/LTE at 800, 1800, 2100 and 2600 MHz. The company claims a 99 per cent 4G availability all over the country. Where KPN already offers carrier aggregation, the theoretical maximum speed of its LTE network is 225 Mbit/s. KPN markets this configuration as “4G+“. KPN has offered VoLTE since October 2016. The Dutch subsidiary of the international Vodafone Group acquired the formerly independent operator Libertel in 2003, forming Vodafone Netherlands. In 2016, it merged with the cable and fibre operator Ziggo. Today, 50 per cent of the joint company VodafoneZiggo is owned by the Vodafone Group and another 50 per cent by Liberty Global. VodafoneZiggo is the second largest mobile operator in the Netherlands with around 5 million mobile customers equalling a mobile market share of about 28 per cent. The company also specifies nearly 4 million video, over 3 million fixed broadband and about 2.5 million fixed telephony subscribers. For the calendar year 2017, VodafoneZiggo announced a mobile revenue of 4 billion Euros. The company operates 2G networks at 900 and 1800 MHz, 3G at 2100 MHz and 4G/LTE at 800, 1800, 2100 and 2600 MHz. Vodafone claims to offer more than 98 per cent coverage with 4G (up to 150 Mbit/s). In many Dutch regions the company offers “4G+“ up to 250 Mbit/s. VoLTE was introduced in November 2016. In 2000, the German Deutsche Telekom bought a minority of the Dutch mobile network operator Ben, which two years later was extended to a 100 per cent acquisition. In 2003, Ben was renamed T-Mobile Netherlands, with the brand “Ben“ becoming a “no-frills“ offer within its portfolio. In 2007, T-Mobile Netherlands additionally acquired the operator Orange. At the end of its fiscal year 2017, T-Mobile Netherlands reported 3.85 million customers and a revenue of 1.4 billion Euros which equals a mobile market share of about 21 per cent. In December 2017, the company announced to acquire Tele 2 (see next column). T-Mobile Netherlands operates 2G mostly at 1800 MHz, 3G at 900 and 2100 MHz and 4G/LTE at 900, 1800, 2100 and 2600 MHz. The company claims a 4G coverage of more than 99 per cent of the Dutch population. With 4G+, T-Mobile network offers a maximum down-load speed of 300 Mbit/s. VoLTE was introduced in October 2017. The Swedish telecommunications operator Tele2 acquired the former Versatel N.V. in 2005 and merged it with its existing Dutch operations. Originally acting as a MVNO (mobile virtual network operator), Tele2 nowadays operates its own infrastructure and has a portfolio of fixed telephony, data, internet and mobile telephony products. At the end of its fiscal year 2017, Tele2 reported more than 1.2 million mobile customers which equals a market share of about 5 per cent. As a result of the announced merger with T-Mobile NL, Tele2 will hold a minority stake of 25 per cent in the combined com-pany. At the time of writing this report, Tele2 operated its own network and T-Mobile NL announced to continue to use the Tele2 brand in the market. Tele2 operates its own LTE network at 800 and 2600 MHz and offers roaming in the T-Mobile 2G and 3G networks to its customers. Tele2‘s 4G network claims a coverage of 97 per cent of the country and offers carrier aggregation (“4G+“) up to 225 Mbit/s as well as VoLTE.